The US Virgin Islands are surrounded by a precious, understudied resource: gorgeous, thriving mesophotic coral reefs. Occurring at depths of 30 - 150 meters, certain coral species have adapted to thrive in the low light conditions of this deep water environment. More and more, these deep reefs are recognized as potential refuge for shallow water corals impacted by warming temperatures and human activity. Research taking place on these reef systems are supported by VI-EPSCoR’s Mare Nostrum Caribbean initiative. Fourth in the world for publications on mesophotic coral ecosystems, proceeded only by Australia, the continental US and Puerto Rico, scientists at The University of the Virgin Islands (UVI) were invited Discussion Leaders at the prestigious Gordon Research Conference Mesophotic Coral Reef Ecosystems taking place June 17 – 22, 2018. Dr. Tyler Smith, Associate Research Professor of Marine Science led a session on “Mesophotic Reefs and the Deep Reef Refuge Hypothesis”. 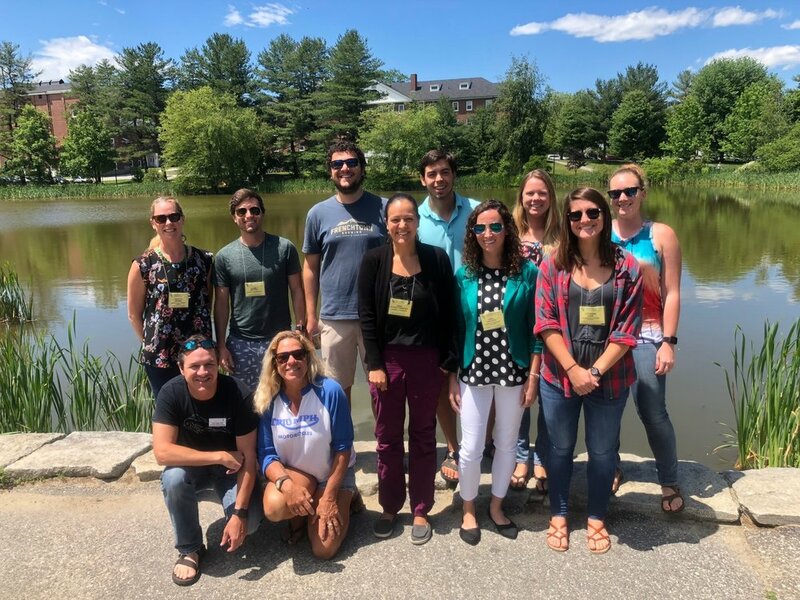 Dan Holstein, a previous VI-EPSCoR post-doc, was invited as Discussion Leader for the session “Reproductive Ecology of Mesophotic Coral Organisms”. Also invited to be a Discussion Leader was Dr. Rick Nemeth, VI-EPSCoR Senior Scientist and Research Professor of Zoology and Marine Biology at UVI. Dr. Nemeth however, was traveling on a research expedition and unable to participate. To be invited as a Discussion Leader is a tremendous honor, recognizing these scientists as leaders in their field. Bottom. Tyler Smith, Ph.D, Elizabeth Kadison, Andia Chavez-Fonnegra, Ph.D, Karli Hollister, Kathryn Egan. Also in attendance at the conference from UVI were Dr. Marilyn Brandt, Research Associate Professor of Marine and Environmental Science, Viktor Brandtneris, Rossie Ennis, Elizabeth Kadison, Sarah Heidmann and recent post-doc Andia Chaves-Fonnegra. Additionally, all UVI MMES graduate students who applied to participate were accepted and received travel awards to attend the conference. They are Joseph Townsend, Karli Hollister and Katharine Egan. Even at depths of up to 150 meters, discarded ropes are tangled in the reefs. Yet, these corals thrive when their shallow-water counterparts suffer warming temperatures. The Gordon Research Conferences (GRC) are highly respected international scientific conferences which provide a forum for presentation and discussion of new, unpublished research at the forefront of its field. The GRC limits conference attendance in order to encourage a free flowing exchange of ideas and discussion in a closed meeting setting.